Saturday for lunch, Amy and I stopped by Bethesda for a quick lunch. We happened by a Salvadoran place called Costa Del Sol. We remembered eating their pupusas at Taste of Bethesda last year and Amy was having a real craving for them. Costa del Sol is just a small restaurant on Fairmont Ave. Decor is very plain and there is pretty much no ambiance -- but honestly, I couldn't give a crap. What did matter is that we ordered some chicharron pupusas (pork and cheese) and chicken tamales and they were outstanding. The filling was spicy which made up for the fact that the marinated cabbage was fairly plain. Overall, I'd say that Costa del Sol's pupusas competed with those of Samantha's which we all know and love. As well, the tamales we excellent and actually were made with large chunks of potatoe. I don't have much else to report about Costa del Sol except that it is extremely reasonable as far as prices go. Both me and Amy had to pupusas and a chicken tamale and we got out of there for less than $12. If your in the area you should definitly stop by. I certainly plan to. Click here to see where Costa del Sol is located. Cashion's Eat Place. The name sounds rather deceptive doesn't it? The name makes you think of some soul food place that serves you buffet style. However, Ann Cashion and John Fulchino's French-American restaurant in Adams Morgan is anything but that. Saturday night when we dined there, we had the luxury of sitting in the window. Every five minutes, someone would walk up in jeans and a t-shirt looking for a quick bite to eat. When they took one look at the menu, their eyes popped out of their heads and they quickly did a 180 in the other direction. We first went to Cashion's when we first moved to DC, before Ann Cashion won her James Beard Award. I was happy to see that the restaurant hasn't changed much. Saturday morning, I called to make the reservation because I was too absent-minded to call the night before or any other time in advance. I got their answering service, but it turned out that you could leave a message to make a reservation, so I did. The answering service said "If you'd like to make a reservation, please leave you name, phone number, the number of people in your party and the time you'd like to make your reservation after the beep and we'll call you to confirm." My response was, "Hello, my name is Jason Storch. I'd like to make a reservation for anywhere from 7 to 9:30 pm. Thank you." And then I hung up. Instantly, Amy said, "Uh...did you forget something?" "You didn't say how many people you wanted the reservation for," she barked. Anyway, I called them back again and left a new message with the full information that they had requested in the first place. Later, someone from the restaurant called me back as promised I also remembered to leave my phone number the second time). They didn't have anything the times I wanted though. I had a choice of anywhere from 5 to 6 PM or 10 PM. Damn. We chose 5:45. I later found out at that if you want your choice of times on Saturday night, you have to call by Tuesday. Before I get to the meal, let me tell you about one thing. The $5 valet doesn't start until...well, until sometime after we arrived at 5:45. It probably started at 6, but Cashion's web site mentioned nothing of a start time for the valet. Anyway, I was driving around Adams Morgan for about 20 minutes trying to find a spot. OK. Now onto the food. Amy's not drinking, so I had to choose from the wines by the glass. Most of the glasses ranged from $8 to $9. I did take a quick look at the wines by the bottle. For a restaurant where the entrees range from $20 to $30, I would've expected the wines by the bottle to be more expensive than they were. There were many in the $30 to $40 range. Amy began her meal with a roasted beet, goat cheese, and walnut salad. Amy loved the beets. For some reason she said the beets were soothing. I loath beets. I'm not sure what it is about them...the texture, the flavor, the fact that they turn your tongue red...I.LOATH.THEM. I did, however, like the goat cheese which I spread on the bread they gave us. I started with a goat cheese and leek tarte, which tasted really strong, and creamier than I expected. A word for any vegetarians out there (Not that Cashion's Eat Place is vegetarian friendly at all), but there were two pieces of bacon on the tarte, which was not mentioned on the menu. I wasn't all that crazy about my entree -- organic beef short ribs on top of risotto with fava beans, peas and caramelized onions. The short ribs were tender and would have been great on their own, but the sauce ruined it. It made the dish more like a stew. The short ribs were swimming in the sauce which was extremely over-powering. Thinking back, it serves me right for ordering beef short ribs which aren't the finest quality of meat by definition. Frankly, I'm sick of seeing every restaurant with short ribs on their menu. I should've ordered the bison filet or the lamb roast which I would've enjoyed much more. Luckily for me, Amy didn't finish half of her Mediterranean Dorade. If you're unfamiliar with what dorade is (like we were when Amy ordered it), here is a fact sheet on the fish. The fish was roasted to perfection and cooked very simply (unlike my short ribs) with some grilled veggies, black olives and lemon. The fish tasted like and had the consistency of salmon, with a slighly meaty texture. After our entrees, neither of us had much room for dessert, but we ordered some anyway because you always want to order dessert at Cashion's. We opted for the chocolate hazelnut terrine which our waiter recommended. I was expecting a slightly larger piece of cake than what appeared, but since I wasn't very hungry, I didn't mind. On the side there were hazelnuts covered with hardened caramel, basically like a hazelnut brittle. The chopped hazelnut layer in the cake had cinnamon in it as well with cut the sweetness of the chocolate. It was all VERY good! Service was excellent -- Attentive, but not over-attentive -- Friendly, but not too friendly. Our food came out perfectly timed. At no point in our meal did I look around wondering where something was. Like I said, perfect. Cashion's does a nice job of keeping the reservations spread out and not overloading the servers and the kitchen staff, unlike some other restaurants that we've been to lately. Our bill came to about $100 for two appetizers, two entrees, two glasses of wine, a dessert and a cup of coffee. Overall, I was pretty pleased with our visit to Cashion's Eat Place and we'll probably go back again soon. Parking: None - Good Luck finding a spot in Adams Morgan. I ended up parking illegally. Valet available for $5, just be patient. Much thanks to A Full Belly for pointing this link out to me. Looks like I need to make another trip to 2 Amys. Don't hate me. 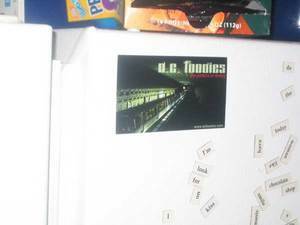 I ordered some D.C. Foodies magnets. If you'd like one, send me an email and I'll mail one to you. For full info, go to Andale's web site.